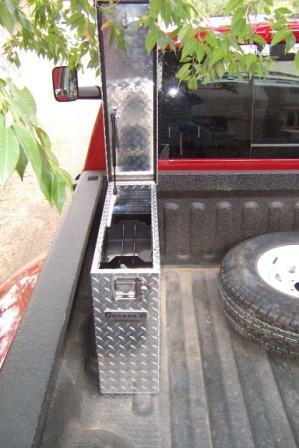 Truck tool boxes and RV tool boxes for your RV from Geneva Manufacturing inc. Some Truck Tool Boxes from Geneva Manufacturing have Big Red Looking Fine! These truck tool boxes are going to keep my tools in a fine and orderly condition. There's nothing worse than being broke down somewhere and have to dig down to the bottom of some grubby tool box, trying to find a wrench... or the right screwdriver. If you want to avoid that, put in a few proper truck tool boxes and you'll feel pretty smart every time you walk out to your rig and see 'em! 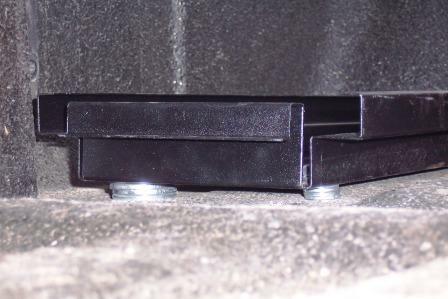 These tool boxes are going to work well for tow vehicle tool boxes, or general RV tool boxes. I can see the 5 drawer tool boxes being installed in one or more of the cargo bays, of the basement of a big motorhome. Distribute your tools in some way, throughout the drawers, that makes sense to you, and the next time you bust something, out in the mud and the rain, at least you won't be wasting time trying to find the right tool to make the repair. Installation was pretty simple.... good thing... 'cause I'm pretty simple too. **WORD OF CAUTION**... Look carefully, under the truck, before you drill those holes!!! Make, CERTAIN SURE, that you are not going to drill a hole in something you don't want a hole in! On that left front box, for instance, two of the holes are directly above the fuel filler neck. A little careless drilling there and I'd have had a real mess.... Just take some care and you'll be fine. Since the bed deck of a pickup isn't flat, I needed to buy some washers to serve as 'shims'. They were stacked under the tool box, as I put the mounting bolt through. That way they leveled the box out where it sits on the 'corrugation' of the truck bed, and keeps it steady; not rocking back and forth on those ridges and valleys. Only took an hour or so, working by myself, to get the back boxes in. If I'd had some help handy, I could have had someone to hold a wrench, while I crawled around in the dirt, to tighten up the nuts underneath. As it was I just propped a wrench inside the bases and tightened away. Just a lot more of back and forth. Good exercise for old geezers! Once the bases are bolted down, the tool boxes just slide right into place. 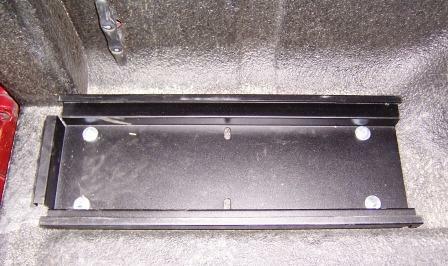 There is a spot, just inside the door of the box, to put a sheet metal screw, to keep the box from being removed. 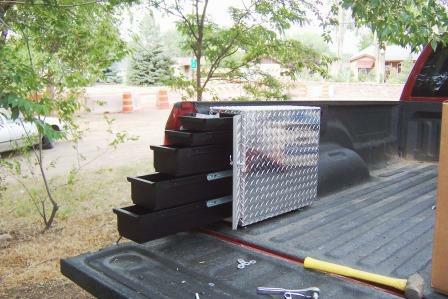 With the back 5 drawer tool boxes set in place, I could move on to the front mounted, top loading Truck Tool Boxes. These were even simpler since they had no seperate base to be installed first. They still needed to be shimmed with washers, to level out the mounting on the 'corrugated' truck bed. 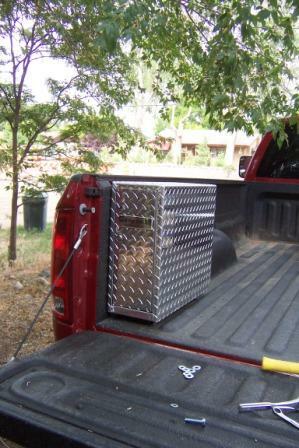 You know, my initial plan for truck tool boxes only had two. I was going to put one top load on the left side and a 5 drawer, truck tool box on the right. Well DOH! Turned out, the top load boxes are too long to fit behind the wheel wells. Good thing too! If I had mounted one of those, back by the tailgate... I sure wouldn't be able to get into it with the fiver on! Not unless I jack-knifed the rig anyway. Just think about that. Dark rainy night... blown tire... jack in the box... UNDER the fifth wheel! That would have been a bad night going down hill in a hurry! Then I got to thinking... and that's always painful... and I decided that you just can't have too many storage compartments on a rig... so I held out for four boxes. What do you think? Looks pretty awsome don't it?... now, on to the auxilliary fuel tank up there in front... where that spare tire is sitting now. Look around. Do some shopping and some cogitatin'. 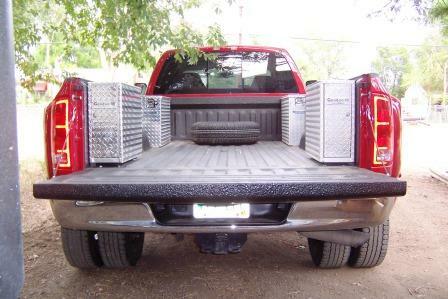 Figure out what kind of truck tool boxes you need for your rig and then have some fun gettin' it all set up to toot YOUR whistle!